I am a researcher focusing on South Asian religions, especially the Hindu traditions in India, but also their globalization and diasporas, as well as the religious pluralism of South Asia which includes Sikh, Jain and Buddhist tradition. I have published widely in these fields but many of my publications have focused in particular on Yoga and Sāṃkhya, both classical and contemporary, and on ideas and rituals of space and time. I have a PhD in Religious Studies, and was trained in the Sanskrit textual and historical traditions of Sāṃkhya and Yoga in Varanasi, India and in California. 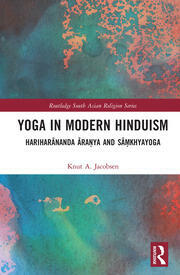 My interest in Sāṃkhya and Yoga is not only as historical phenomena but I have also been involved with contemporary Sāṃkhyayoga traditions and practices and have just published a book on a contemporary Bengali Sāṃkhyayoga institution (Yoga in Modern Hinduism). This book is a result of a long term interest both professionally and personally. PhD, University of California at Santa Barbara, 1994. Sāṃkhya, Yoga, Indian philosophy, pilgrimage, processions and sacred geography in South Asia, globalization of Hinduism and Hindu diaspora communities, religious pluralism in India, Sikhism, Jainism. Trekking in the mountains is one of my major interests, especially in the Himalayas, but also in the mountains of Norway and other mountainous countries and areas.